Global Insulation Market size was worth over USD 45 billion in 2017 and is anticipated to grow at around 6.0% CAGR over the forecast timespan. Rapid industrialization and rising construction expenses in emerging economies are primarily driving the need for better infrastructure and insulating materials for appropriate use of limited energy resources. Growing demand for advanced building materials offering more durable and energy efficient homes will drive insulation market size. Increasing electricity consumption likely to prompt modern building techniques among builders to minimize the overall operational cost. Favorable government policies in line with energy efficient building construction in India, China, South Korea, Brazil, Malaysia, and Sweden is anticipated to fuel insulation market demand. For instance, Concerted Action Energy Performance of Buildings Program which is jointly built by the Member States of the European Union and European Commission promoting new buildings construction complying zero-energy standards up to 2020. Regulatory bodies including International Energy Agency, National Insulation Association and American Society of Heating, Refrigeration, & Air Conditioning Engineers (ASHRAE) are encouraging usage of insulating products across the new residential building and retrofitting. Energy Performance of Buildings Directive in Europe has set the minimum performance standard for new buildings and major renovation in the building for installation of insulating materials. Ongoing technological developments and increasing application of advanced materials with high R-value across commercial buildings are anticipated to boost insulation market expansion. Heating & cooling applications are estimated to account for over 50% of energy consumption in an average building. Thus, these insulating products are expected to save thousands of dollars in utility bills over building lifespan. Shifting trend towards recyclable materials offering superior profitability and the reduced material cost will induce a positive effect on the product penetration. According to North American Insulation Manufacturers Association, around 1.2 billion kg of recycled glass was used in manufacturing thermal and acoustical insulating products for residential, industrial and air handling in 2013. However, stringent regulations governing conventional products, such as foamed plastics may impact industry growth. Fiberglass/glass wool insulation market registered over 6 billion square feet sale in 2017. It is widely used in attics, critical opening spaces, and wall cavities. key features such as better elasticity, soundproofing, lightweight, non-combustible, and exceptional thermal defense performance at both high & low temperatures likely to propel product demand. Strong application scope for improving the energy consumption of the buildings, offering a comfortable environment and reducing the fuel utilization will positively influence the product penetration over the forecast timeframe. Plastic foam will witness growth over 3.5% up to 2024. EPS offers high performing padding used in the external wall system. The product offers enhanced U-values and minimizes the risk of water penetration and condensation. Availability of the product in various thickness ranging from 20mm to 100mm depending upon the building specification and customer requirement will positively drive the product penetration. Insulation market from residential applications accounted for more than 50% of the industry share in 2017. Government initiatives and supporting policies regarding development in housing sectors such as Affordable Housing Institute (AHI) will induce a positive effect on the product growth. Proliferating population in Asia Pacific along with development in commercial and industrial construction will support the segment growth. HVAC and OEM applications will register CAGR over 6% up to 2024. Rising demand for fire resistance, acoustical control, moisture control and mold resistance will drive the insulation market demand from the industrial sector. Increasing manufacturing activities supported by proliferating HVAC demand will fuel the product demand over forecast period. North America insulation market is anticipated to be worth over USD 16 billion by 2024. Surging promotional activities by the government regarding energy efficient housing schemes are generating strong demand for insulating products. According to U.S. Department of Energy stated regarding American house accounts over 50- 70% of energy consumption. It has also provided guidelines for insulating techniques that reduces the cost of air leakages of home, energy consumption, energy utilization for heating and cooling purpose at commercial buildings and domestics houses. 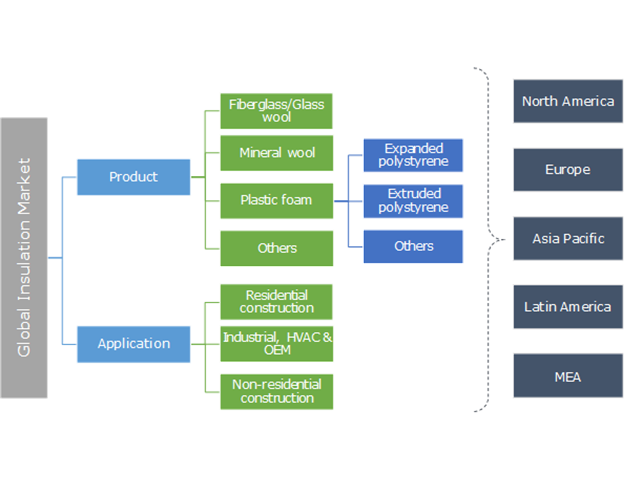 Asia Pacific insulation market will register growth over 6% up to 2024. Rising living standard coupled with government support for better and accessible services are key factors driving regional growth. China civil engineering industry size was valued over USD 1.5 trillion in 2015. 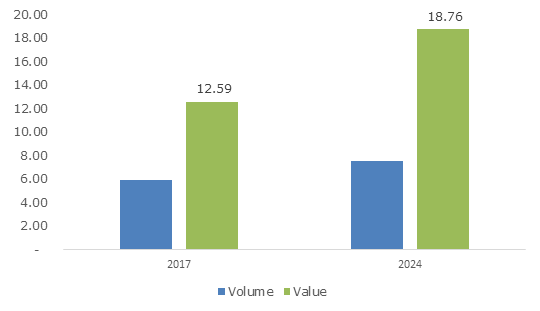 High population growth in China and India accompanied by construction industry expansion likely to augment insulation market size over the forecast period. Global insulation market share is highly fragmented due to the presence of a large number of industry players operating in the comprehensive market. Several multinational corporations are expected to adopt modern technologies to gain competitive edge. Regional and small-scale manufacturers are expected to form long term contracts with raw material suppliers. Owens Corning, Rockwool International, Knauf Gips KG, Armacell and Huntsman International are some of the major revenue contributors in the global insulation market. The industry players in are involved in several strategies to gain competitive advantage and improve their market share. Mergers & acquisitions, joint ventures, collaborations, product innovations, production capacity expansions and supply agreements are among the strategies adopted by industry participants. Companies are also focusing on integrating the value chain including forward and backward integrations. For instance, Huntsman International is backward integrated with operations in polyurethane production as well as insulation manufacturing. Global insulation market growth is driven by rapid technological advancement in the industrial sector. Industrial demand includes coverings for boilers, machinery, pipes, and tanks. HVAC application includes coverings and linings for HVAC equipment. Increasing trend of insulating materials in OEM applications such as major household appliances including refrigerated transport, aircraft, shipping, motor vehicles, fire doors, containers, solar panels, and coolers will provide a strong business outlook for new industry participants. Developed regions are expected to have a more positive outlook towards sustainable building measures as fallout from global financial crisis recedes, government support and consumer incomes improve. Emerging economies such as China, India, South Africa, Brazil, and Mexico will significantly play a bigger role in overall market development owing to huge consumer base along with shifting trend for advanced building techniques.